Happy Monday! I hope y'all had a great weekend. 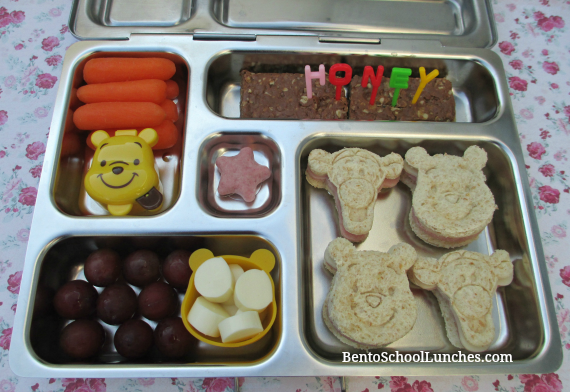 I've been thinking that my days of packing Pooh and friends lunches may be numbered, hopefully not so much for the lunches but for sure the cute bento boxes. Nikolai is growing up so quick and boys' his age wanna be cool, he hasn't yet made any suggestion or request to that effect though, which is good as I enjoy looking at them myself! 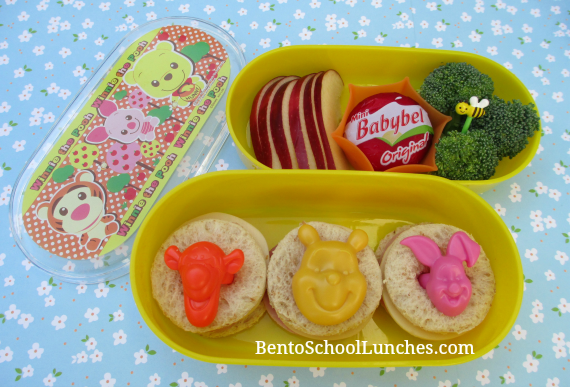 Here is the first Winnie the Pooh, Tigger and Piglet bento for which I used cupcake rings to decorate; they fit nicely above the circle sandwiches. His sides were organic apple slices, Babybel cheese and organic broccoli florets with a bee pick. This double tiered bento box was given to Nikolai by my good friend from Japan. The next lunch is Pooh and Tigger sandwiches, cut and stamped, easy peasy. I made some no bake chocolate chip, almonds, oatmeal energy bars and included some in his lunchbox with 'honey' alphabet picks. His sides were organic baby carrots, ranch for dip in the cute Pooh container, yogurt star, seedless red grapes and sliced string cheese in a Pooh face container. This lunch was packed in his Planetbox Rover. Awwww both are adorable! Winnie the Pooh is one of my favourite characters! Both are adorable, we love Pooh too!